Yes, those choosing T-Mobile's Value Plan have to pay the full retail price for their new phone. Of course, that price is divided into 21 monthly payments with no interest. And with the carrier's 4G Super Sale this weekend, prices of some of these models have been discounted. And customers who choose a Value Plan during the sale will receive a mail-in rebate of $50 to $300. When you are paying full retail for a phone, it is hard to see where the savings come in, but a leaked chart made for T-Mobile reps shows that there are 5 devices that will have a monthly Equipment Installment Program monthly rate of $20 after an increase on December 17th and 18th. 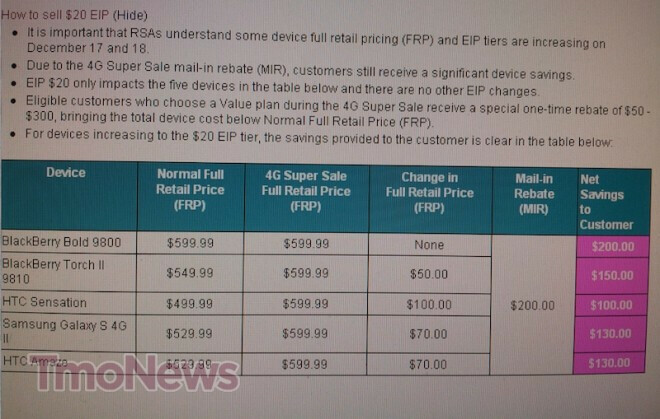 The leaked screenshot below was obtained by Tmo News and was sent to reps to show them how to sell a phone with a $20 EIP by revealing to a customer how much he can save with the 4G Super Sale this weekend. Let's take a look at the Samsung Galaxy S II 4G as an example of how this will work. The normal full retail price of $529.99 is being raised to $599.99 during the 4G Super Sale (Yeah, we know). In the meantime, those who choose the Value Plan will grab a $200 mail-in rebate. That results in $130 in savings to the customer. Of the 5 devices with the $20 EIP, the BlackBerry Bold 9800 offers the biggest savings with a $200 savings while the lowest savings at $100 is for the HTC Sensation 4G. Alright, seriously, someone needs to do research before they write the next article on a Tmo sale.. its not that hard and im tired of having to explain it over and over again. There is a $480 difference per single line on the Value plan compared to the Contract plan. easy math value plan unl everything 2gig web $60 x 24 = 1440 contract plan unl everything 2 gig web $80 x 24 = 1920 1920-1440 = $480 in SAVINGS An SGS2 costs 280 on contract before rebate 1920 + 280 = $2200 An SGS2 costs 530 on value plan 1440 + 530 = $ 1970 2200 - 1970 = $230 savings on the same phone, with the same package, but just on the value plan instead of the contract plan 230 + $200 sale rebate = $430 in total 2 year savings over the regular contract plan + phone. compare that to the cost of the Skyrocket on ATT with unl everything and see how much your saving for the same phone on a different carrier (Tmobile) And if your not doing the most expensive phones, the savings is even greater. Is it REALLY that hard to understand???? I know ive done the math probably about 10 times on these boards explaining it.